The layout of the entryway in our new home is such that it actually connects the front door and the entry from the garage. Because of that, I want to create a space that functions like a mudroom, but I want it to be quite attractive because it is the first thing that someone sees when entering the house. I love this entry from Pottery Barn. 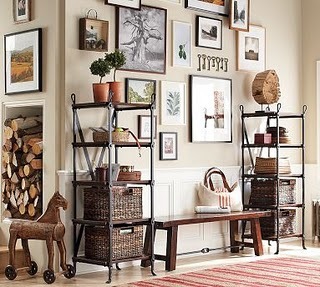 I love the gallery wall, the eclectic feel and the fact that it has a little bit of a rustic edge to it. Functionally, it could really use some hooks for jackets (where would those go?) and somewhere for shoes, but the baskets would make great storage for the kiddos school papers etc. Then there is this lovely mudroom that I found on Houzz.com. Although I'm in love with the ladder, it would be an accident waiting to happen in my house with 4 kiddos (especially with my 2 little boys..oy!) and because we are renting this house, we couldn't do a built-in per se, but the hubby can easily recreate a similar look that we would be able to take with us when we move. What's your opinion? Eclectic? Traditional? I'm interested to know. Frugal Friday goes live tonight at 8 MST. i say traditional! you could always mix it up by putting up a piece or two inside each cubby...maybe that reflects the occupant? I agree with you that the PB entry is beautiful...but I don't think it's particularly functional. Not really a lot of storage, especially "hidden" storage. The traditional one is also beautiful, but much more useable. You could incorporate some fun colors/textures/patterns with your baskets, and you can still hang stuff on the walls! I think for an entry the traditional is beautiful................In my house the pottery barn would end of with everyones keys and stuff like that thrown on it. I live in a house full of the men type! It's based off of a PB entryway hutch. You can customize either with a sorting station or not. We are modifying the sorting station to just have more cubby space for alllll our stuff. I love both of these! I wish I had a room like that second picture in my house! i just LOVE the second pic!! For an entryway, I vote function all the way. The first pic has lots of interest, but my kids do enough to add "interest," aka clutter, to a room. 2nd pic, definitely. Traditional with a little mix of PB for interest! I'm with SuzyQ. Combine the two. Maybe only take the Houzz idea to the locker height then go ecclectic above. Let the two percolate. You'll come up with the perfect solution! Love the Traditional space. You can easily remedy the ladder predicament, with either a custom fold-up ladder, a "hidden" ladder (perhaps put some sliding doors on to cover a few cubbies), or a gorgeous vintage step stool. I'm not a fan of PB, I much prefer all things hand crafted opposed to mass market, just my opinion. Good luck! I'm sure whatever you decide it will be Fabulous! I'm drooling over the ladder and all the storage possibilities. Drooling! love LOVE the last mudroom! Gorgeous...although I can see how the ladder can cause issues haha and the chandeliers really add that pop of character! We're going for the PB version right now. We're about 1/4 of the way done. Hopefully in two weeks. Hopefully. I've got building fatigue. Be still my heart! That mudroom is spectacular! I just need to carve out a large niche for it somewhere in my house. functional! i think the first one, where it looks very pretty, will be very hard to keep clean and organized. we have something like that and we still have shoes and jackets and mittens and hats piled up on the bench. i am a fan of storage that you can close a door on...too much openness it that one for me! Entryways get cluttered enough as it is (or at least mine does!). Traditional gives you a clean start. The PB version has a lot going on visually to begin with. Love the built in look. To mix the two could you use old picture frames for the cabnet fronts? The you could even change out the pictures seasonally.